We've all come to love James Corden's 'Carpool Karaoke' and Adele's edition might just be the best so far. 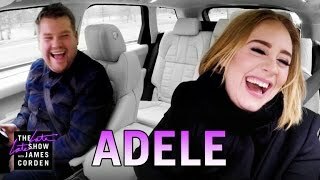 Adele and James Corden's carpool karaoke is probably the best edition of the segment we've ever seen mainly because the pair genuinely seem like they're having the most fun in their lives. Adele rapping Nicki Minaj's verse from Kanye's 'Monster', singing along to the Spice Girls anthem 'Wannabe' and belting out her own masterpieces are just SOME of the highlights from the video. Unlike other carpool karaokes, this is the first to take place in the UK! Don't miss the moment Adele does the most British thing we've ever seen in our lives and DOWNS a cup of tea like a boss.